Designed as the original Magnum pistol cartridge, the .357 MAG is renowned for its stopping power, high velocity and impressive range, making it an ideal choice for self-defense or hunting large game. Its dual use in revolver and carbine also popular in Cowboy Action Shooting competitions. Drawn from premium American-made brass cups, these casing are rigorously tested to ensure unparalleled durability and dependability, each casing undergoes rigorous in-line and post- production quality assurance testing to ensure a flawless casing. Standard casing dimensions and tolerances have been modified to achieve maximum performance. 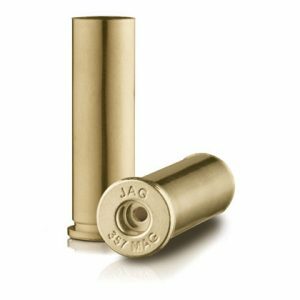 Jagemann™ Sporting Group’s in-house tooling and engineering capabilities provide the ability to customize casing dimensions for use with specific projectiles. We can meet your needs.